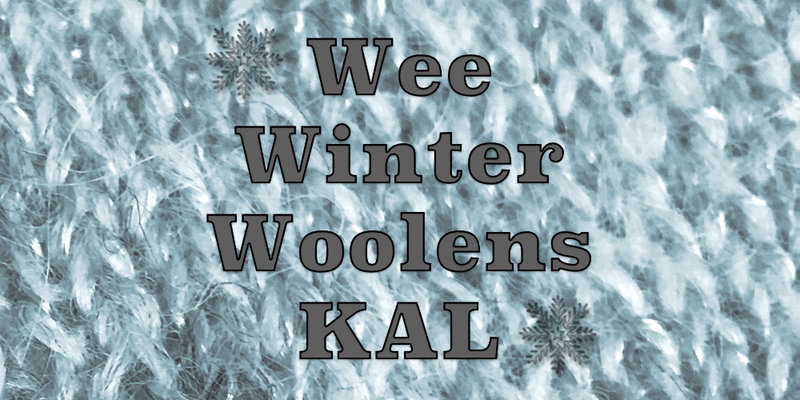 So, I am busily writing the patterns and knitting up the sample for our upcoming Wee Winter Woolens KAL. You guys know I love to knit tiny things. 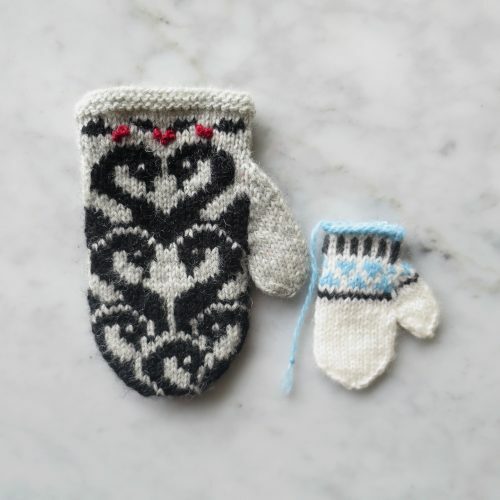 Tiny needles and tiny stitches in the round are my thing, but as I was knitting the twelve stitches for the thumb on the mittens I started to think, “Some people are going to hate me for this.” Here is the mitten for this KAL next to one from our 12 Days of Christmas KAL last year. I realize not everyone is going to like knitting such tiny things and some of you might actually want slightly bigger finished pieces. So, today I want to be talk about the size of the items in this KAL and what your options are. Option 1: Knit these up just like I am. My set is going to be the wee size. The hat is just over 1.5″ wide, the stocking is about 3.25″ long, the sweater is about 6″ wide and 3.25″ tall and the mitten is just under 2.25″ long. So not only are you knitting things at a tiny gauge you are knitting a smaller number of stitches in the round. If this isn’t something you have done much of, it is totally doable with a little practice. I personally love how they turn out like this. 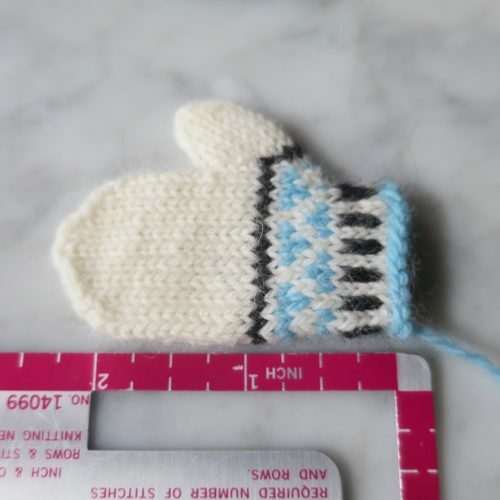 My best tip for getting comfortable with knitting these small items is to invest in a set of 4″ sock needles. (I say invest, but a whole set of these on Knit Picks is $25.) I find knitting small pieces in the round is so much easier when you don’t have a lot of extra needle to deal with. Option 2: Change the size by using a bigger yarn or knitting at a larger gauge. My gauge for this is 10 stitches by 12 rows per inch. If you knit these at 8 stitches by 10 rows per inch, you will get bigger finished pieces. For example, the hat would end up being 2.25″ wide by about 2″ tall. You could try knitting these up in sport weight or just use bigger needles. You’ll still be knitting a smaller number of stitches in the round, but your stitches will be bigger. 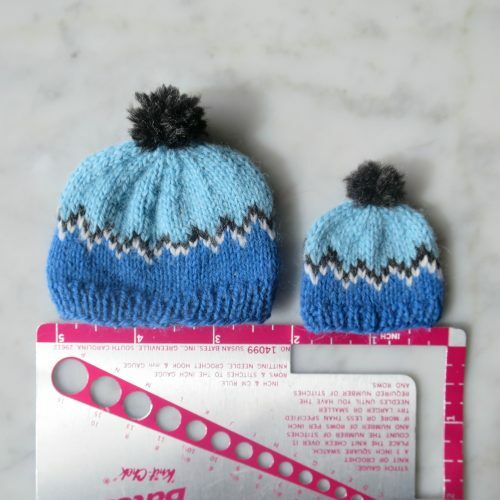 Option 3: I’ve decided to offer the patterns for the hat, mittens and stocking in two sizes, let’s call them wee and tiny. The bigger one will be exactly the same design and gauge, but about 60% bigger. I will not be giving the sweaters in two sizes, because that is a much bigger kettle of fish. 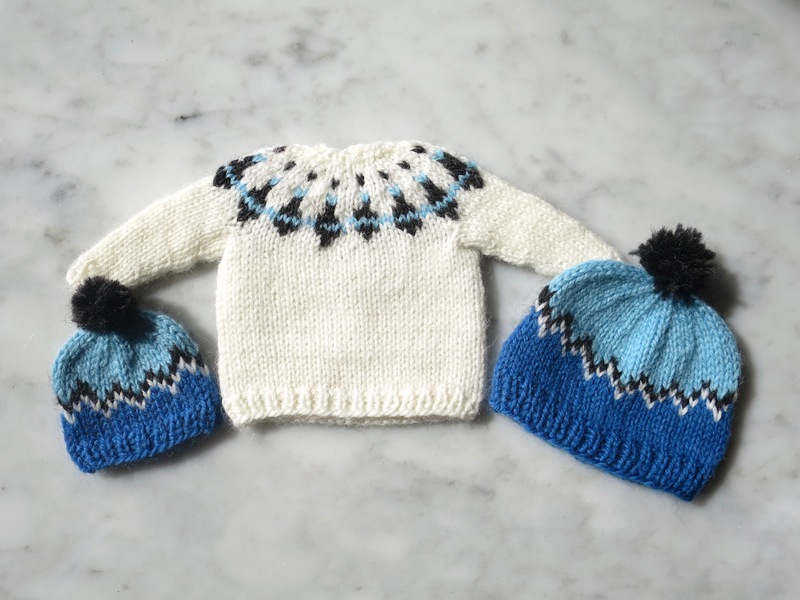 Here are how the two sizes of hats with the sweater. I know some people are planning on using these on a wreath. For that purpose, I would make the wee size, but if you are thinking of a garland you might actually like the tiny size. Bother sizes are great for hanging on a tree or topping a present. I love to see how everyone makes it their own!